@minhye1822 glad you are watching this drama with us, I am so crazy over it ! @mywebfoot welcome *wave* so glad you are here , now we need to summon @azzurri here to spazz with us. As @briseis said, she is a sweetheart , always wanting to share her latest crack with her chinggus, it was of course thru her that i found briseis's ramblings . Is it only 10 eps? Was hoping for 12 . Ep 6 subbed should be out tomorrow . Angela, dear, I don’t know who you are or where you are, but you just might have singlehandedly saved our ship! Long live the ex-girlfriend list as Junko learns her monk is definitely NOT A VIRGIN! And that he has much more experience than we have given him credit for! Oh, the sheer disbelief and disappointment at her face when she realizes she won’t be his first! LOL! It’s hilarious how she gets even more infuriated with each new name of his past girlfriends and the final straw is ANGELA! And I think I know her reason because it strongly suggests that his proficiency in the English tongue language isn’t entirely due to the first-class educational methods of the Tokyo University, as if the thought that he learned English from someone else than her was the greatest betrayal of them all! She looks so mad as if he cheated on her with all of them at once! On the other hand, it only proves how blind she’s been this whole time, pining all her hopes on Kiyomiya while completely ignoring the man who has been right in front of her wearing his heart on his sleeve. How could she not noticed what a catch he is - handsome, kind, loving, loyal to a fault, intelligent, rich, devoted and most importantly completely in love with her. Junko can’t process it nor deal with it so she turns aggresive and as a revenge, in the next BE lesson she keeps picking on Takane, literally bullying him and making him into her personal whipping boy, making the whole class witness their first jealous scene! Takane has no idea what’s going and she even makes him give her the longest and most elaborate apology in the BE possible. He is so desperate that he hilariously clasps his hands together like in a prayer with the funniest pleading expression in his eyes EVER! Afer the lesson he hurries to her, completely baffled and alarmed what the hell has he done this time to make her mad. Of course, she is in a total denial and replies “who is angry?, he tells her she totally is but says she totaly IS NOT and he should immediately leave the classroom since the lesson is over. Awww, the poor puppy, he looks so adorably dejected that his teacher crush is mad at him. By the way, I completely didn’t realize this before but it’s also a teacher-student romance…well, sort of. In other news, we learn that Takane is doing his best to prepare the memorial, he even cleans the Sakuraba tomb and places flowers there for Junko’s grandmother (more about them in the next post). Also, we finally get an explanation how did Takane manage to get that omiai with Junko in episode 1 when he didn’t know her at all - obviously the high priest and Junko’s dad has been friends for a long time. In the previous episode, he himself mentioned that he considers Takane as his own son and it’s clear he must have noticed that Takane was interested in Junko…after she almost killed him with that urn. So Takeda set up the omiai in cooperation with her parents. Fuji TV still hasn't officially announced whether it will have 10 or 11 episodes, either way we have passed the halfway mark. My guess is 11 judging from the fact that the 2014 Autumn Gekku "Nobunaga Concerto" had 11 episodes and finished just before Christmas. @briseis thanks again for another awesome write-up. Gotta say I am disappointed that Takane has had girlfriends before. All those scenes where he looked at books searching for dating answers gave me the impression he has absolutely zero experience. The chief Monk mentioned to TK 's grandma on how happy he looked after he met Sakuraba, guess he has never been in love before and all the 4 seasons were mere crushes. 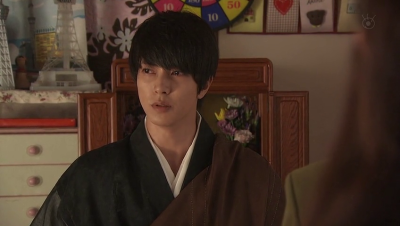 I didn't read the manga but I read somewhere that the drama is rather watered down , less racy, hehe. Hope it is 11 eps, the eps are so short at 45 mins each, hopefully we get a longer finale Ep and a Special Ep. @briseis @Ahpheng But should we believe what the high priest said to her? Sorry but the names you mentioned (Spring, Summer, Fall and Winter) are seasons. So saying that he spent time with Spring... could also mean that he lived with the coming seasons. And as for Angela, it could be the song from John Lennon and Ono he would listen in the past. Maybe he is trying to help Takane by making Junko jealous! Like you wrote, he is the one who organised the omiai. To me, he had no real experience with dating. You are smart @bebebisous33 ;-) (it's the reason why I inserted the translation of those names in the quote). It's just that I write these ramblings chronologically and I try to incorporate the feelings I had about a particular scene when I watched it first. Actually, during the wedding it is suggested that the high priest made it all up but I'm kind of a slow writer. So don'T be sad @Ahpheng ;-). @briseis I really enjoy reading your comments! It smoothes the waiting. Besides, I couldn't have thought about it without your translations! I suppose, the grandmother asked the younger brother to come back so that she could use him! IT seems, he is different from his brother so that I can imagine that Tanake has always been acting more as a father than as brother. If I am not wrong, the grandmother might intent to use the brother so that Tanake will behave again more as someone who has a huge sense of responsabilities. It would be great, if her plan backfires on her again. 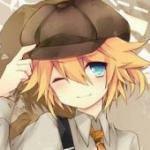 Ahhh... @briseis hehe, I was fooled by you and the chief monk . I am happy now ! @bebebisous33 you smart lady !! Actually, I think most viewers were misled and the hint during the wedding is only a subtle one. I would say that it's the writer's intention and goal to play on the prejudices and expectations of the viewers - he gives hints and if you connect them with the way the particular characters acts, what we know about them, then we should make our own assumptions. Only later he reveals what really happened. Remember how everyone thought Takane backstabbed Junko during the ELA exam? Even the preview was put together in a way that everyone pretty much codemned Takane without hearing his explanation just like Junko. It's something I like about the show - with each episode it proves how easy it's to misunderstand a person, how easy it is not to trust, not to believe in someone, and also that mostly we are wrong. I think it's a major motif that repeats again and again and each time the writer manages to get us. @briseis, yes I was one of the few or many to jump into conclusion that Tk really back stabbed Junko during the ELA exam. I liked that he admitted from the beginning that he had a part to play in her not getting the job, so that she wouldn't feel like she was NOT good enough for the job . I don't know how much relevant it's to mention this here, since the writer has pretty much deviated from the original source in every way possible, however, in the manga Takane's grandma also calls for Amane to come and actually separate Junko and Takane. It turns out all very HYD-esque when he intoxicates her and pretends that he slept with her. But I don't know how much the writer will use the source material considering we are at episode 6 and there hasn't been even a single OTP kiss. @briseis Thanks for the info! I hope, the writer will deviate from the manga because that's so common. It would be better, if his brother saw his brother under a different perspective and decided not to follow his grandmother's instruction. This is Takane’s answer when Kaori asks him the typical supremacist question after she got rejected by him: why does he lose time preparing such a small, unsignificant memorial. It pretty much illustrates why they can’t be and why he will never agree to marry her. There is no such thing as an unsignificant memorial - each memorial means that a person died and her or his loved ones were left behind with an empty place in their heart; and each person deserves to be remembered. 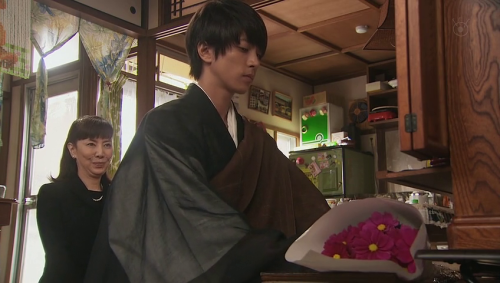 On the day of the memorial Takane comes bringing flowers for Sachie-san - it’s a bouquet of red cosmos, her favourite (I mean this man should start a detective agency as a side job, next to being a cameraman-documentarist, florist and a famous Buddhist priest; first he gave the granddaughter the pink ones, and now the grandmother! Seriously there is no limit to the perfection of this man!). According to Takane “in Hanakotoba they mean love, they are full of love just like Sachie-san was.” Keiko remembers that on the day she became dad’s girlfriend/bride she gave her the very same flowers and begins to cry. He also asks to say a few words before he begins to chant the sutras. OMG! It’s so poignant and fitting that it is Takane who notices. Takane, the man who is so seriously and thoughtful and devoted to everything he does. Considering his childhood and upbringing it makes a total sense that he has become the introvert, the silent watcher who always observes and rarely speaks, because it’s usually the ones who hide their emotions the most that are the most sensitive and it’s tears they hide behind their mask of reservedness, proving that reservedness doesn’t always mean emotional deficiency. His perceptiveness and ability to empathize helps him understand people, especially the restrained ones, who guard their emotions because he is one of them and knows to look for the little hints and nuances in one’s countenance. I think it isn’t his dignified behaviour that makes him such a high-regarded priest but his ability to empathize and never fake his concern. OMG! THIS IS SO RAW AND BRUTAL! I admit I cried and who wouldn’t?! The look of utter sadness and devastation in his eyes! There are so many emotions there, so much hurt and lonelinesss it’s almost painful to look him in the eye. It’s so much more heartbreaking because in that moment it isn’t the famous priest who is talking but the 7-year-old boy who lost his parents and has grown into a lonely man. It’s his own experience that he is talking about and every single word is sincere and real. There are no empty words and he does truly mean them because he understands the pain of losing someone and having to live a life without them. While Junko has never known the lack of love and affection and takes it for granted, Takane regards it as something rare, miraculous and precious and almost unreachable, something he desires above all else. I think a part of his message also means that we need to keep living because it’s the best way to honour their memory and repay the ones who are no longer with us for their love. I love the way Takane’s character develops so slowly and gradually throughout the whole story. I didn’t use the word ‘changes’ because I believe that rather than changing, he is breaking out of his shell, becoming the man he would be if he had a normal childhood. His mask is gradually breaking and it enables Junko to see the real man behind it - one starved for love. I think this is the first moment she properly looks at him and sees him in a completely new light. What I love the most, though, is that the final decisive factor which moves her heart towards him isn’t her (another hint: possibly unsubstantiated) jealousy but his sincerity. Thx for ur explanation on each scene @briseis, I can understand bit n pieces of the language but with ur post, it became much clearer what the scene was all about. I for one am glad that the drama didn't follow 100% to the manga and knew that grandma was behind Junko's fallen job interview. Takane has so much goodness and innocence that he would not hurt the one he loved so much. Hopefully we can get a KISS scene soon coz I'm excited to see their progress since not many episodes left but the once a week waiting is really bad for me. Honestly, I haven't read the manga, I only browsed through it before the drama premiered and I pretty much hated every single character there, particularly Junko and Takane were both so unlikable. And I thought there is no way I'm going to watch this and that it is such a pity that when YT and IS get to play a couple it would be something like this. However, then I watched the first episode and realized that not oly the writer deviated greatly from the original source but that he has also basically a competely new story from scratch, only using the names, occupations and relationship links. I will forever thank the drama gods for this. I can also understand only bits and pieces of the Japanese language and my knowledge is purely passive and rudimentary, gained after years of watching jdramas. The whole wedding sequence is so awesome and basically each few seconds there is new adorable moment. 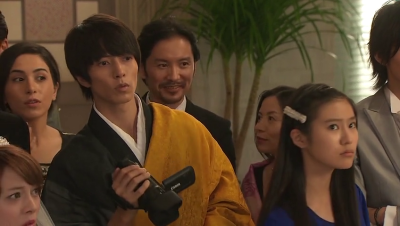 Takane as the camcorder addict and self-proclaimed wedding cameraman slays all hearts and ends up saving the whole wedding in the process. I love how it’s so obvious he is enjoying himself there among his friends and acquaintances and that he feels at ease. He will probably never be able to make small talk, but there is this aura of belonging and happiness which wasn’t there during the aprty scene back in episode 1 where is was simply an outsider. I found it brilliant how the writer incorporated the camera as a medium which allows us to relive our memories, to revive them, to bring back the things we have forgotten and for a moment the people who are no longer among us. It may even allow us to notice and realize things we haven’t before, things that we missed because we were too busy and singlemindedly focused on striving for future than living and savouring our present. In one way the scene with Takane ending up as the saviour of the day reminds me of something I wrote about the final scene of episode 5 where Takane spent so much time and effort to prepare the date and did all those things most people find silly and useless, only that in the end it turned out that they weren’t useless nor silly at all. It’s the same here. 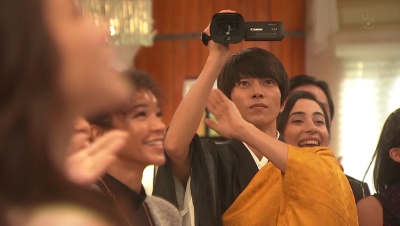 Takane is again so old-fashioned, buying a camera when most people would simply bought a smartphone and filming homevideos with the same obssession people used to do back in the 90s. And everyone found it silly and annnoying but in the end it saved the happiness and the most important day in a life of two people. Thank you @ororomunroe for making this thread! I just finished watching ep 1, and currently downloading ep 2. I watch it because of Yamapi hahaha. My friend (both of us are Yamapi's fans) asked me whether I've watched Yamapi's new drama and I was like, "Why I know nothing? Gosh!" My bad. I have yet to read the manga. Will give it a try later. Helllooooooooo there and big hugs!! Thank you thank you thank you for tagging my name so many times, till I finally came over here. HUGE THANKS to Mod @ororomunroe for creating this thread. 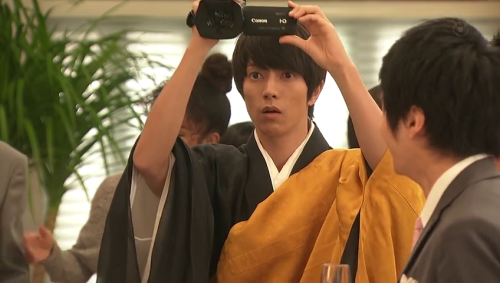 I'm soooo happy to see so many Jdrama lovers (including the two I converted ehemm) here. It's true, since d-addicts closed their torrent site it's much harder to download Jdramas, and since many awesome jdrama subbing teams have stopped subbing, it's also much harder and/or takes longer to get J-subs online. So I'm really glad 5To9 is accessible to us all. And @briseis you're a sweetheart for saying I'm one. Hehe. Love your little write-ups - not yet up to speed with Ep 6 right now, but will come back with thoughts on that later. For now just to say overall, I love this drama. And honestly I didn't think I would. Because I read online that the characters from the manga are not very likeable. 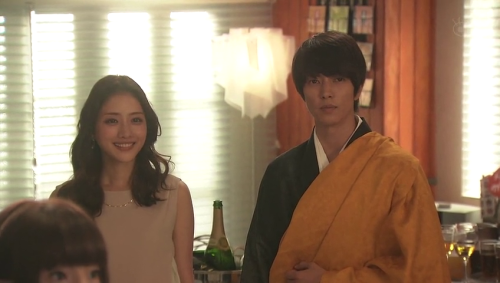 Thankfully they cast Yamapi and Ishihara Satomi, which made me want to watch anyway. 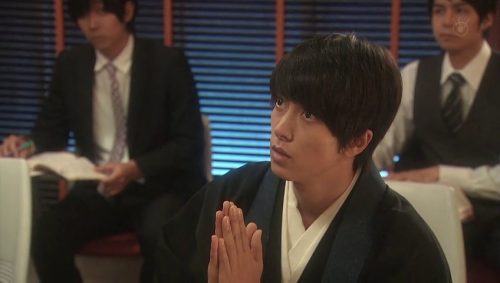 Yamapi, I have been a fan of his since his Nobuta Wo Produce days. He isn't known for his acting, but somehow he has always chosen such good dramas, so despite some acting limitations I have loved most of the dramas I've watched him in! 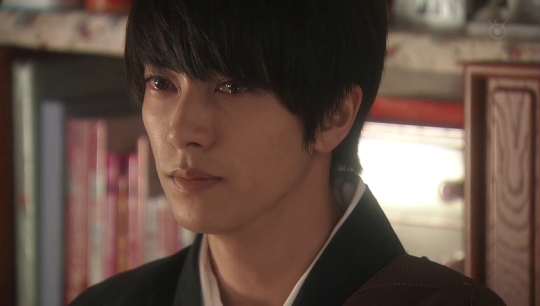 And this role as Takane is perfect for him. Actually I think his acting has improved in leaps and bounds - he's really mastered Takane's stoic yet nuanced expressions. I love it. 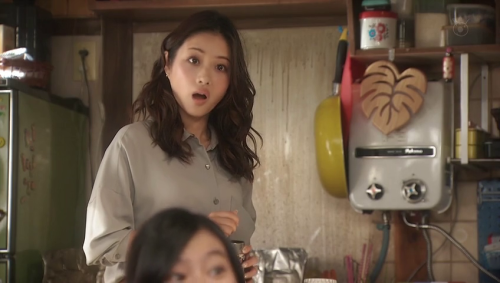 As for Satomi, have loved her since her RMPW days, thanks to her great chemistry with Oguri Shun. So I had to try this out, and I'm so glad I did. I was still on a Twenty Again withdrawal at that time when I discovered this drama, so it was the perfect cure for me. And there was so much that I learned. For starters I didn't know that Japanese monks could get married. And the interesting fact about secular monks - thank you @mywebfoot for the detailed research! Anyway I'm glad to be here and looking forward to chatting and raving about this drama with all of you. And probably, since I'm a dieharf Sogoner-Sogonger, see you on OMV as well!